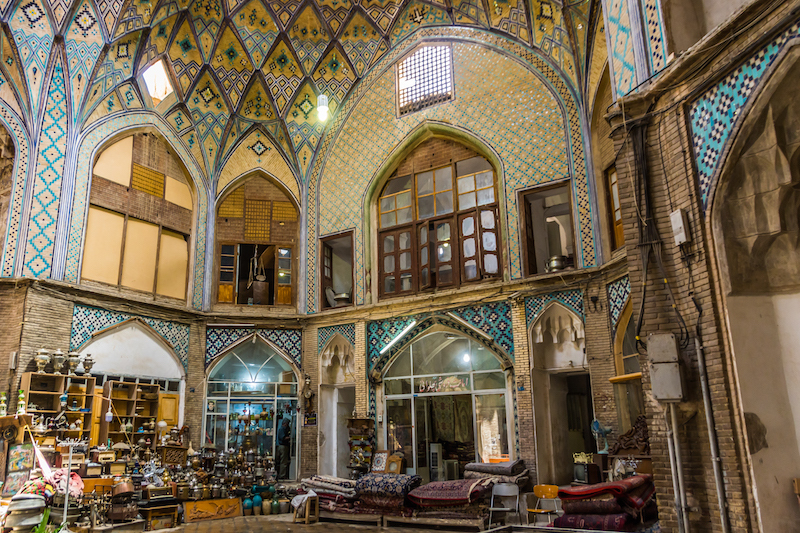 You would think that having visited now a few bazars in Iran, I would be familiar with the architecture. 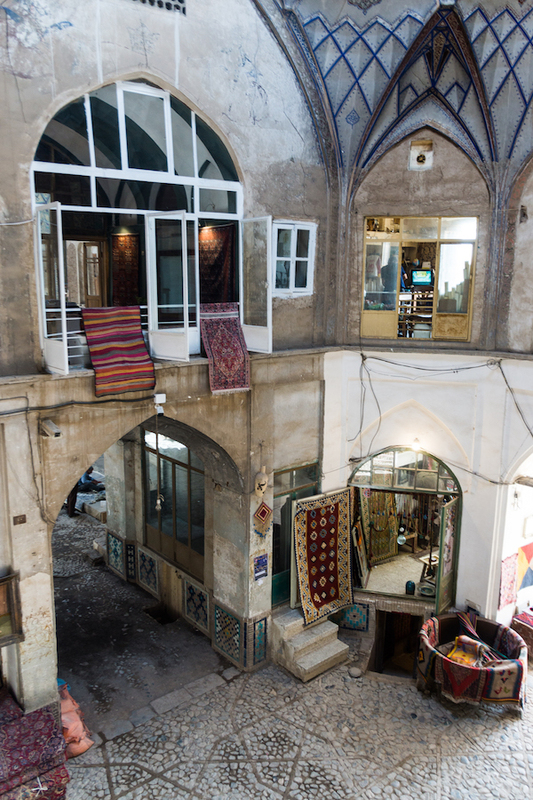 And there are architectural details that are similar in bazars in Iran. 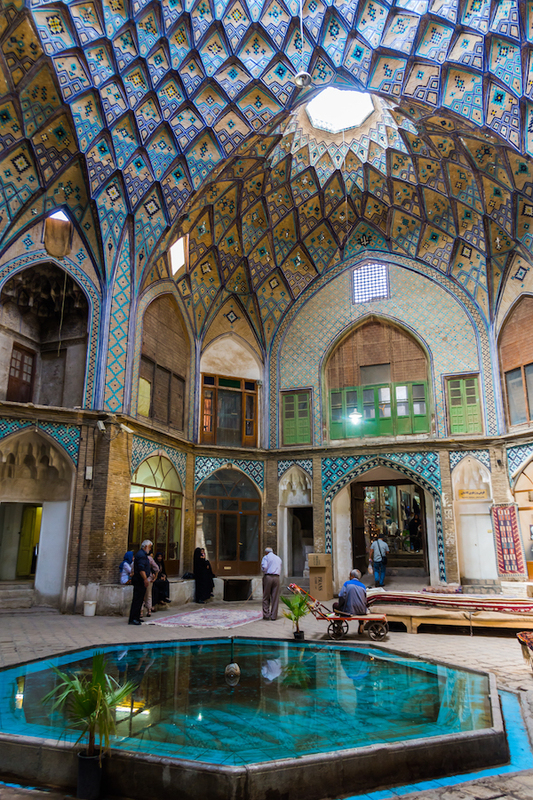 The use of domes in the ceilings, the presence of mosques, baths, old caravanserais and madrasas. 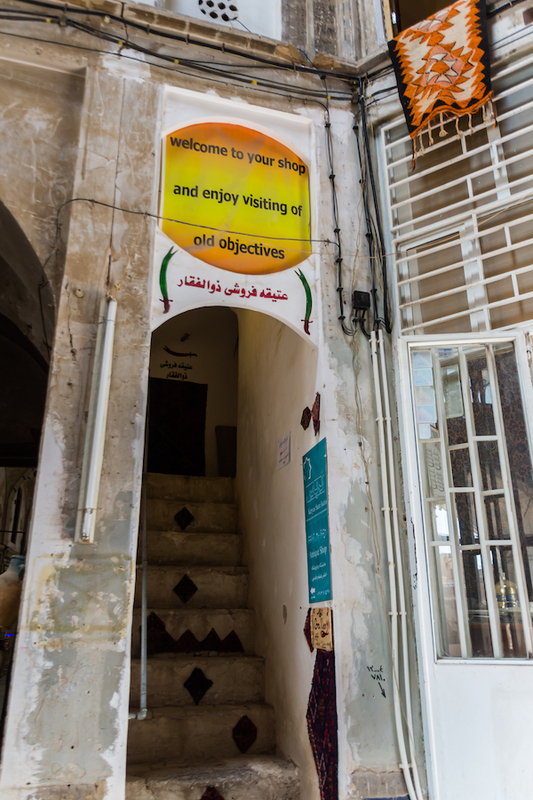 Also the intricate tile work, the narrow alleyways, the different crafts on display. But at the same time, there is always something unique. 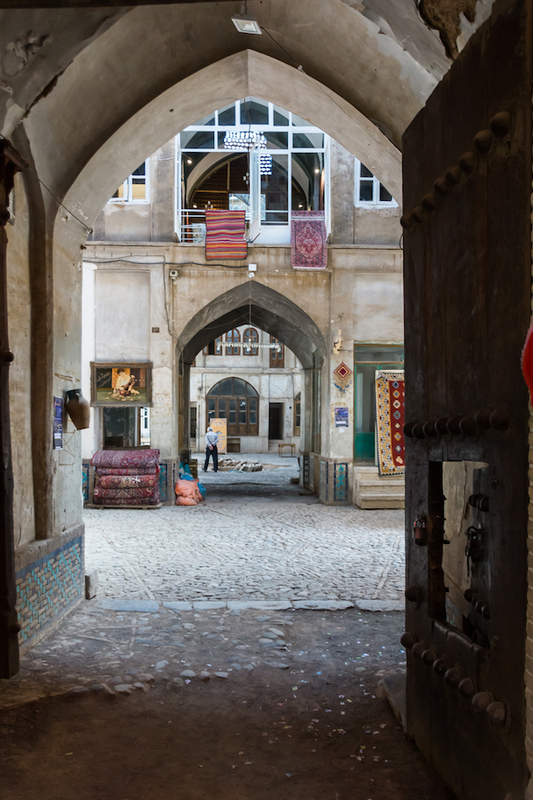 And discovering Kashan bazar was no different. The atmosphere, the beautiful old caravansaries, it was all magical. Often it was like some time machine had let us glimpse the past. A past that most probably started around 800 hundred years ago, having witnessed two Persian dynasties, earlier with the Seljuks and then continuing under the Safavids. The multi domed ceilings dating from the 19th century were a later impressive addition. It was just after lunch and there was a calm, lazy atmosphere lingering in the air. 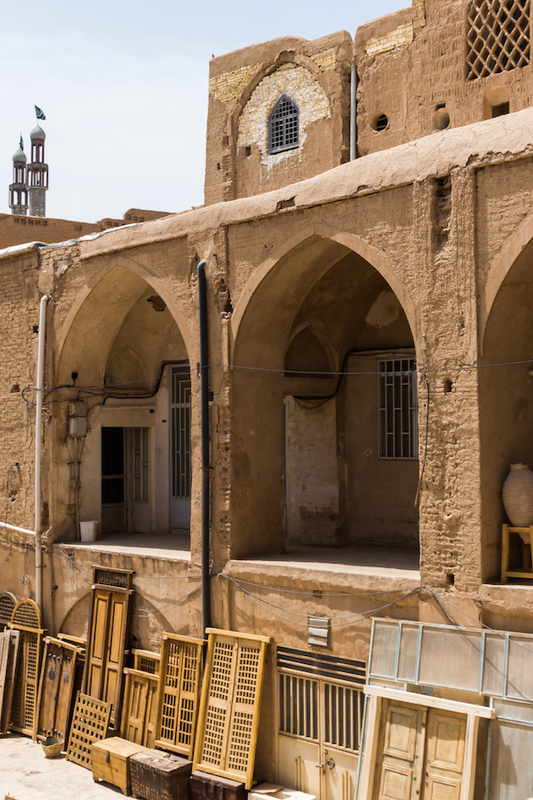 A mandatory stop is the Khan Amin al-Dowleh Timche caravanserai. 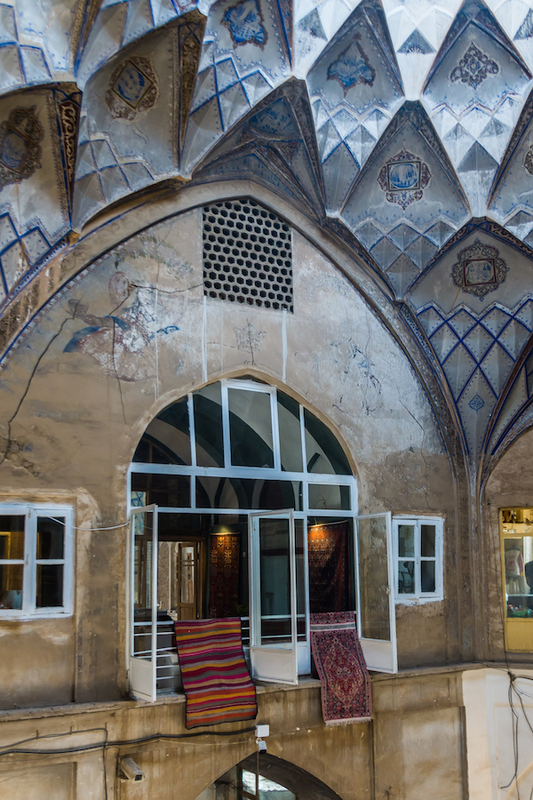 Its wonderful Persian domed ceiling is something you need to see. Except for a few tourist groups, there weren’t many customers around. Just a few people, who looked like they had all the time in the world, just like us. Some shops had closed for lunch, others stood empty, waiting for the later rush. 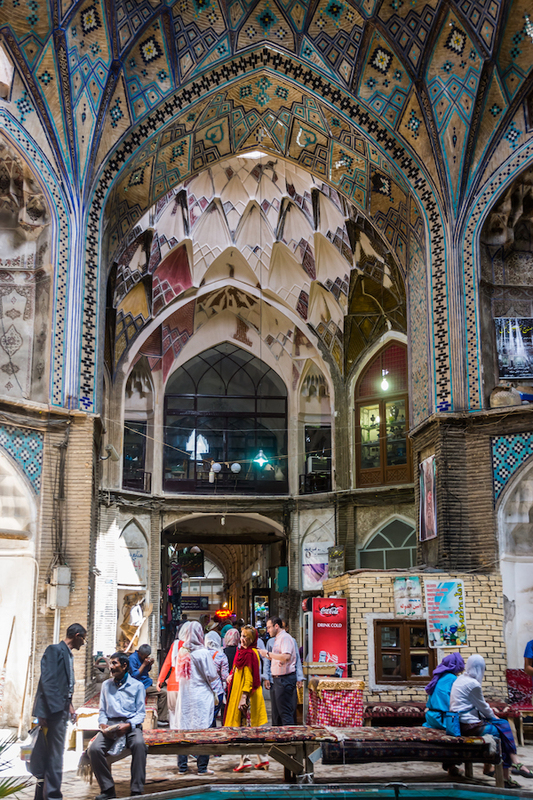 The Bazaris or merchants looked relaxed, some talking in small groups, others profiting to work calmly. When I got to this patio and took the picture, I didn’t immediately see the man sitting in front of his shop. At first glance all shops seemed empty and closed. But then I noticed him sitting alone by his small shop. He had a very dignified look, observing us curiously. We approached and said Salam, he greeted us with a smile. 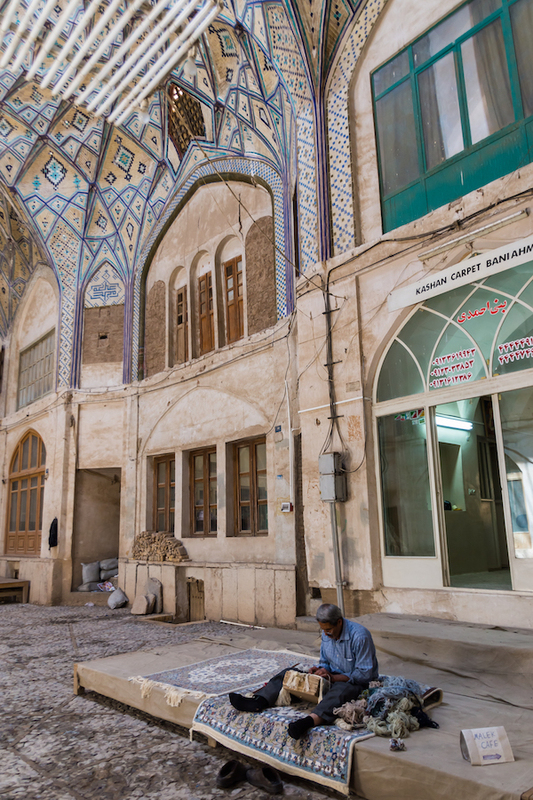 I wondered how many years he has sat there, waiting for customers and wished my Farsi was already good enough to ask. He pointed at his mismatch of old, antique pieces encouraging us to look. I wished we could carry the bigger pieces but we still had a lot of exploring to do in the bazar so I looked for something smaller. 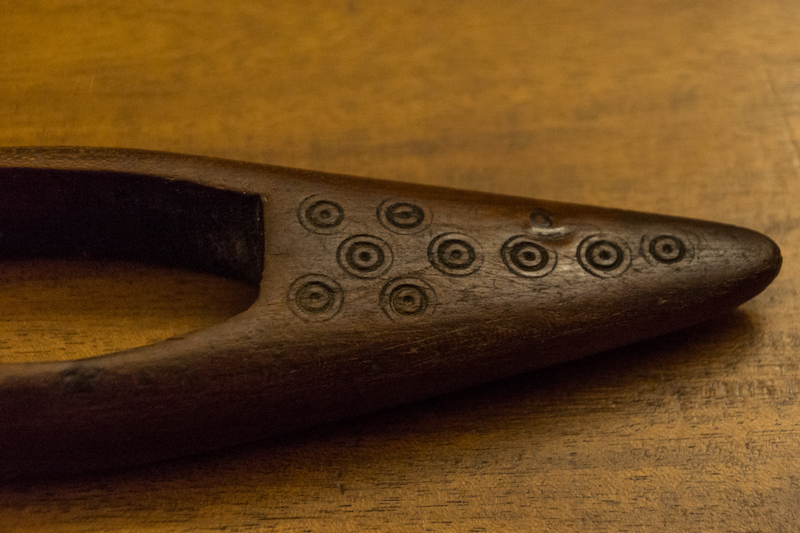 I noticed some beautiful old wooden shuttles used in hand looms for weaving. He helped me choose one and when I asked the price, it was so fair that I didn’t even bother to bargain. We said goodbye and again I wished we could have communicated more, maybe one day, inshallah. 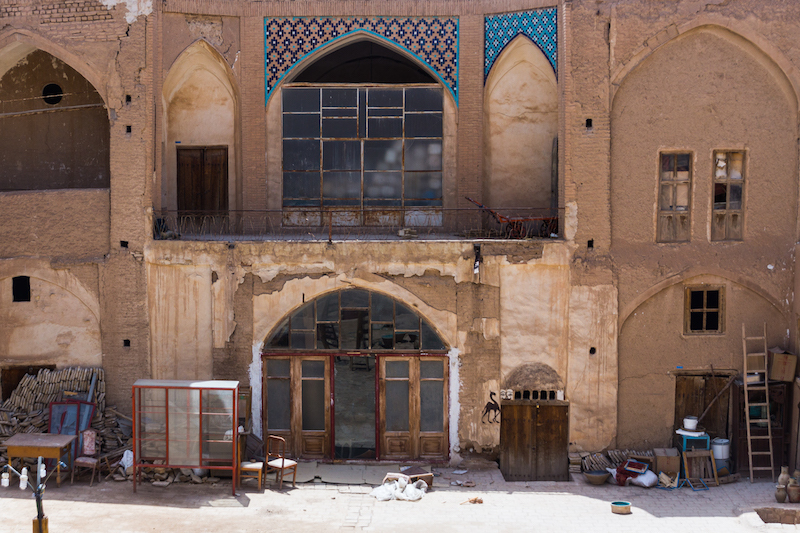 It was great to see throughout the bazar, that the old caravansaries are being restored to their former glory. But even the ones that look dilapidated, have a special charm. I always end up walking hours in a bazar because I often get distracted with something. Alleyways, doorways, patios, it is hard to resist them. And then I saw this sign and how to resist such a title, of course I had to go up and look at the shop. After all we all need goals in our lives. When we got there, there was nobody in sight. I was thinking, this is really being trustworthy when I heard heavy breathing on the staircase. It was the owner who had another shop nearby and had seen us go up. He had been eating lunch. He clearly loved to eat and had gone up too fast, so his breathing was a bit worrying. I started feeling guilty for almost giving him a heart attack. But he was extremely nice and welcoming. He could speak a little bit of English so we could communicate better. 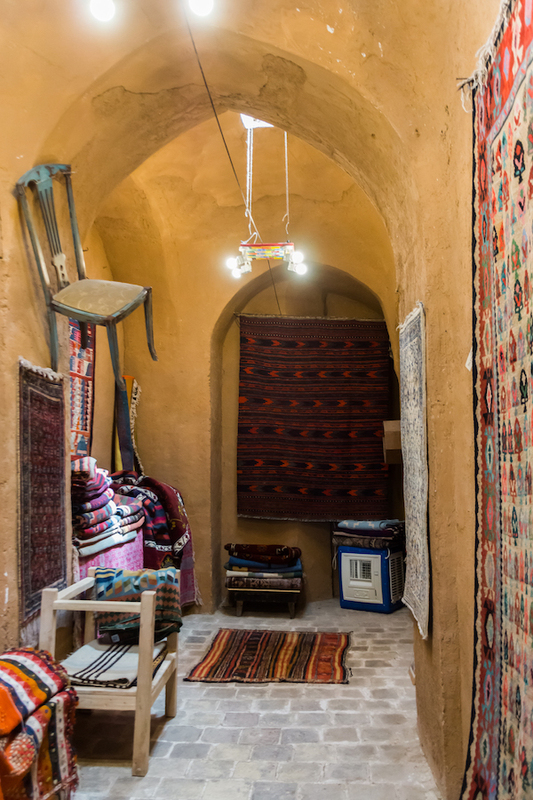 He had nice carpets and kilims but again not convenient when you are walking so much. I told him next time, I must come back just for shopping. I noticed the view from up there to the courtyard and he left me at ease to take pictures. He even pointed to his other shop down there where his son was. We went down to meet his son who could also speak a few words of English. We thanked them for their hospitality and promised to come back, a promise I intend to keep. 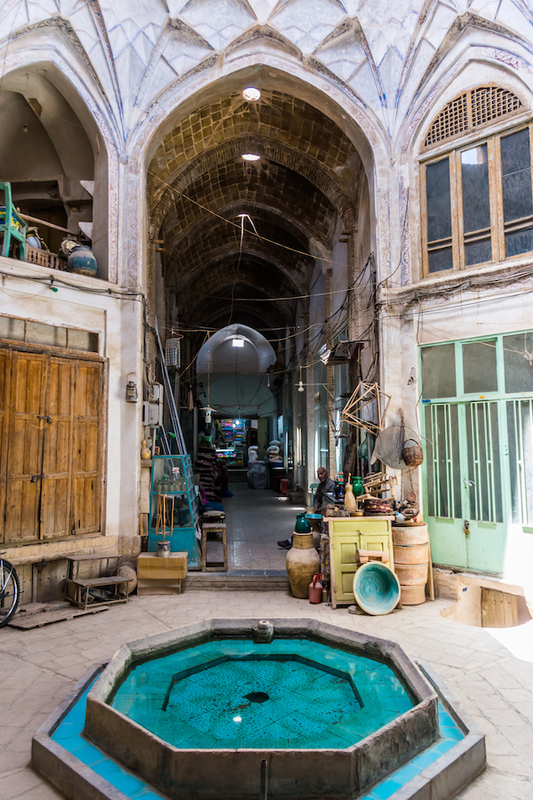 This is for sure one of the most beautiful bazars I’ve seen. It is not very big compared to others but I loved its relaxed atmosphere. Its architecture is very special and you can easily imagine how it must have looked like in all its glory. But somehow I think I prefer the derelict, vintage look. Previous PostPostcards from Tehran: Parvis Tanavoli "Lions of Iran"
Dear Carmen, I know it is hard to believe but I really only bought the shuttle. But of course I wanted to buy much more!